Begonia Irene Nuss can be a large free flowering shrub in the landscape. Canes will reach 4-5 feet. Begonia Irene Nuss is hardy to the mid 20°s F. By hiding Begonia Irene Nuss against a window of the house it has survived temperatures briefly drifting into the mid teens. Begonia canes only, all of the leaves dried out and just hung there. A month later and Begonia Irene Nuss was back on her game blooming like a mad thing. The dark green leaves have a dark red backside. The Angel Wings Begonia has pendulous clusters of flowers that last on the bush for weeks. 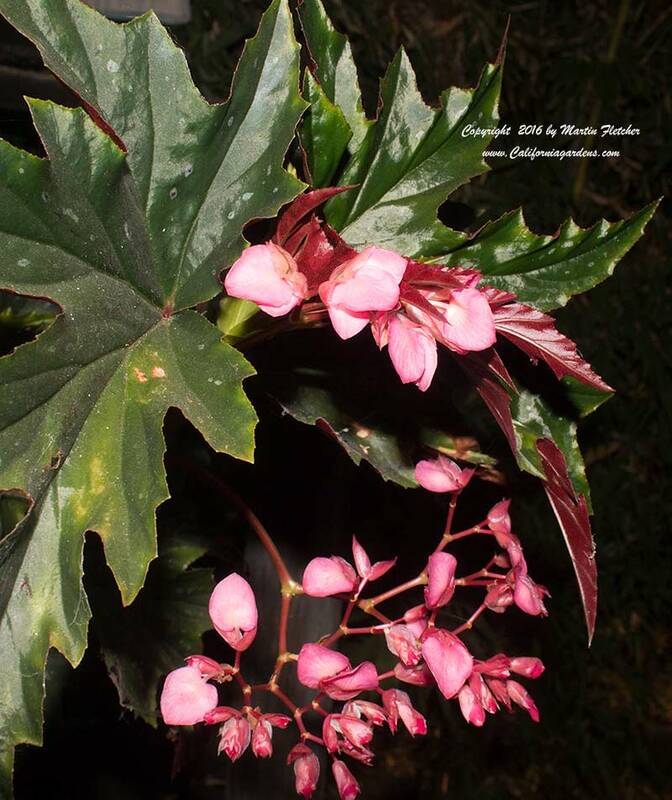 I use Begonia Irene Nuss frequently near the coast and in protected locations in the inland valleys. Due to the preference for very good drainage I usually plant Begonia Irene Nuss in large containers rather than in the ground. For such a tropical looking plant Begonia Irene Nuss is surprisingly thrifty when it comes to water. Water Begonia Irene Nuss at the base, water on the leaves can cause mildew. Flowers and foliage of Begonia Irene Nuss the Angel Wings Begonia are both decorative. High resolution photos are part of our garden image collection.